That little statement comes from a famous Calvinist statement of faith, to which I adhered during my brief tenure in pastoral ministry (1995-1999). Yet here I find myself writing about the Eucharist on the eve of the Solemnity of the Most Holy Body and Blood of Christ, still popularly called “Corpus Christi.” How things change. The readings for this Sunday are wonderfully set up in such a way as to teach about covenant, sacrifice, salvation history, and divine filiation. Like last week’s celebration of the Trinity, this week again celebrates a Catholic distinctive, a doctrine taken for granted by many but which remains controversial and controverted outside the Church (and often inside the Church!). 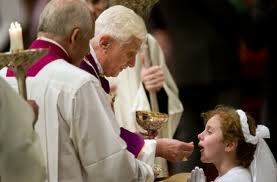 That doctrine is the Real Presence of Christ in the Eucharist. More positively, the sacrifices also provided food for a meal. Families eat together, so a common meal often served as part of the ceremony of covenant-making (Gen 31:44-46). In Exodus 24, Moses and the elders of Israel have a meal with God on Mount Sinai after the blood ritual: see Exod 24:11. The Hallel (“Praise”) Psalms 113–118 are mostly psalms of thanksgiving or Todah psalms. The Todah was particular kind of sacrifice mandated by Moses in Lev 7:11-15. Unlike other sacrifices, the Todah was not offered in atonement for sin, but in thanksgiving for some act of deliverance that God had performed for the worshipper. The Todah ritual also included the consumption of much bread along with the meat of the sacrificed animal—it was a festive meal. As Christians, what is our appropriate response for God’s goodness to us? To participate in our “sacrifice of thanksgiving,” the Eucharist (Gk. eucharisteo = “to give thanks”). Let’s focus on the last verse, vs. 15, underlined above, which contains the heart of the whole covenantal theology of Hebrews. The translation used in Mass is quite good in this instance, because it renders both occurrences of the Greek word diatheke here as “covenant,” which many translations fail to do. The author of Hebrews is saying the following: Christ’s death is the “death that has taken place for deliverance from transgressions under the first covenant.” The “first covenant” referred to here is the covenant of Sinai, which we saw being made in the first reading. This covenant involved a curse of death for any violation. As we saw, that was part of the meaning of the blood ritual: “May my blood be shed if I break this covenant.” Yet Israel did break the covenant again and again, starting with the Golden Calf. And each individual Israelite personally broke the Ten Commandments, as we all do. What then saves us from the curse of death for violating that covenant? Christ death does. He dies on our behalf, in our place. But its deeper than that. Through baptism, we actually participate in Christ’s death. In a real if mysterious way, baptism is a death that we undergo (Rom 6:3-11). Having suffered the worst that the first covenant can do to us, we are free to enter into the “new covenant,” which promises an eternal inheritance—not a temporal physical inheritance of the land of Canaan in the first covenant, but eternal life with God in his presence (cf. Heb 12:18-24). Let it never be said that traditional Protestants interpret the Bible “literally” whereas Catholics interpret it “figuratively.” That is far too simplistic: in key instances this caricature is precisely reversed. The irony was not lost on me during my own journey into the Catholic Church. I found myself unable to argue convincingly against my Catholic friend who was insisting on the plain sense of Scripture, while I was trying to avoid it. When Jesus says “this is my blood of the covenant,” he is drawing a straight line back to Exodus 24:8, the only place in the Old Testament where the phrase “blood of the covenant” is used. Jesus is saying: “What I am doing here now with you, my apostles, is as momentous as what Moses did on Mt. Sinai.” Recall, too, that Moses was surrounded by twelve young men, the priestly firstborn of Israel. Jesus, too, has his “twelve young men,” who represent the new Israel, the spiritually reconstituted twelve tribes. Furthermore, these men will have the priestly duty of offering the todah sacrifice for the new covenant community. They, in turn, passed this priestly duty and authority on to those in succession from them. The covenant ceremony at Sinai symbolized kinship with God, but the Eucharistic sacrifice instituted by Our Lord in the upper room actualizes kinship with God. The blood of Jesus is not merely symbolic but real. It has an actual effect on us, when received with faith: it “cleanses our consciences from dead works,” among other things. Since it is the body of Jesus Christ, and “you are what you eat,” we become assimilated into Christ, we share the body and blood of God, rightly understood, so that we are “partakers in the divine nature” (2 Peter 1:4) and “children of God” (1 John 3:1). If the Eucharist were merely symbolic, we have made no advance over the Old Covenant. But we have advanced: in the sacrament we really become “sons in the Son,” who share Jesus’ filial relationship with his Father. As usual, you did a very thorough job of explaining the texts. The one thing I will mention is the verse which says that Christ is the "mediator of a New Covenant". Frequently, Protestants insist that there is only one mediator and therefore deny the intercessory power of the Heavenly Court. However, Christ is called the mediator of the New Covenant because God established it through Him. Just as Moses was the mediator of the Old Covenant. There is only one Mediator of the New Covenant in the sense that Christ is He through whom the New Covenant was established. But we are all co-mediators in the sense that we all are called to bring others into Covenant relationship with God. De Maria: a good point. I think perhaps we are co-mediators in a stronger sense, because we partake of Christ, and are in fact his body, and share in his divine nature (2 Peter 1:4). Thanks, John. This was an excellent morning meditation for the great feast.